Shoreline Community Services, the partnering agency for the Wednesday night ministries, is working diligently to take over the responsibilities financial and otherwise of this ministry. In this process we have worked side by side with our regular volunteers to learn all the details and tasks that are handled behind the scenes. We have brought in outreach from agencies such as Feeding America, the VA, and Veteran’s Village. These outreach efforts complement the existing outreach of Family Health Centers of San Diego who not only work to get our guests more regular health care but also connect them with government support services. Additionally, connections with our sponsoring agencies and companies have been maintained or reestablished. As we move forward in these efforts, we are excited to announce that we will be initiating a crowd funding campaign through GoFundMe entitled Faces of Grace. This campaign will serve as an opportunity to share the stories of the guests on Wednesday night, many of whom have been attending this meal for years. Through sharing these stories, we are able to put a face and a connection to the homeless and underprivileged in San Diego who regularly seek support, a meal and an opportunity to talk, share and feel human. 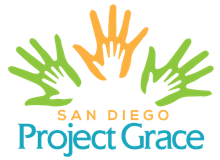 Understanding the moments of grace that we offer each week to this population of people who are so often ignored, we have undertaken the process of renaming Wednesday night ministries as San Diego Project Grace. Working to honor the love and support of this congregation, we have received the blessing for this change from Shalom Council and work in all things to represent the priorities of Pacific Beach United Methodist and the reality that without your support and passion for this ministry, Shoreline Community Services and San Diego Project Grace would not be able to serve in this way. Look for the upcoming video announcements, website updates, fliers, Breeze articles and the like that will share with you the stories we are sharing through our Faces of Grace campaign and instructions on how to share the news of this campaign with your friends, family and neighbors. Thank you for your continued support and love. Without your support, this ministry would not exist.